If you have applications written in VB6, you are now facing some interesting decisions. .NET is profoundly different, and you will be forced to divide your current applications into two categories - those that are worth porting to .NET, and those that aren't. 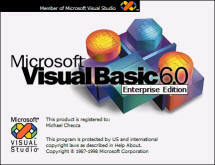 An important difference in .NET is that Visual Basic has become a truly object-oriented language. But the down side is that Microsoft couldn't make this change while maintaining backward compatibility, which means that your old code generally won't compile under .NET. It is possible to run your old code through a filter and get something that will compile and possibly even work under .NET. But in many cases you may need to rewrite substantial sections of code, and in other cases you may want to redo your code and possibly even your architecture to take advantage of the new .NET capabilities. For example: suppose that in one of your apps you formerly wrote a large number of highly similar classes (perhaps using the "Implements" mechanism) because of the lack of inheritance in VB. Even with the most disciplined programming style, these classes might contain a lot of duplicate code that you'd rather not continue maintaining. By rewriting the code to make use of inheritance, you could probably eliminate essentially all of your duplicated code, along with all of the headaches of trying to maintain such code. The automatic converter is a fine solution for older apps that are gradually being phased out. For newer and/or mission critical apps, you'll need to rewrite.